Would You Rather Have a Tummy Tuck or Just Look Like You Did? You are here: Home / Every Day Lives / Tips and Tryouts / Would You Rather Have a Tummy Tuck or Just Look Like You Did? Are you ready for this? I can make it look like you’ve had a tummy tuck in a matter of seconds! Stick with me while I explain my hocus pocus wonders. Oooooh ahhhhh. The other morning I was surfing infomercials like I do when bored lying in bed. No, I don’t usually purchase anything but I like watching them for whatever reason. An infomercial came on for something called The Tummy Tuck. Now this contraption looked kinda like Spanx on steroids. It’s a stretchy girdle-like garment that you slip on around your mid-section. It looked pretty snug fitting from what I saw. They raved that you could sit and read a book or watch TV while the garment used your own body heat to melt away the fat cells and give you a tummy tuck with no surgery. If you so desired to exercise in the middle squeezing device, the fat cells are claimed to practically explode in a thermonuclear meltdown! They had before and after pictures showing huge differences in only 10 days time. The pictures were impressive and caught my attention, but then I noticed something about them. If I hadn’t been grilled over and over about this by Trainer Man and my posing coach, I might not have even noticed. Posture! 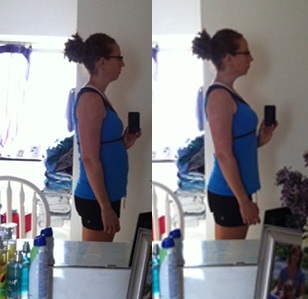 The before pictures had the person with slightly slumped posture – shoulders rounded, hips tucked. Not a huge slump but it was there. The after pictures had the person with shoulders back and standing straight. Subtle difference with very noticeable changes that had taken place. I’m very VERY guilty of walking like the bride of Shrek. It’s habit and not helped by hunching over a keyboard at a desk all day. Poor posture can be caused by a lot of things such as tight chest muscles that pull your shoulders forward and tight hip flexors that tilt your pelvis under. This creates a tummy pooch on even the skinniest person. Stretches that loosen up these muscles such as supermans and runner’s lunges can help with posture. But even just paying more attention to how you stand and sit can make a difference. Make a conscious effort to work on your posture. That’s one of my goals for the week. I wish they had an app for that. So save your money on the infomercial gadget and try my tummy tuck in just seconds. No surgery required.